DataMemberBinding: Allows you to specify the binding to the property, whose value you want to display in the column. ItemsSource: Specifies the data source for the RadMultiColumnComboBox editor. ItemsSourceBinding: Allows binding editor's ItemsSource to a member of the bound data item. DisplayMemberPath: Member path to display. It points to a field in the assigned ItemsSource. SelectedValuePath: Used in conjunction with DisplayMemberPath in the process of translation of a value to display as content. It also tells the RadMultiColumnComboBox editor which property to use as a Value when the user makes selection. NullText: Allows you to set a string which will be displayed in both view mode and edit mode when the RadMultiColumnComboBox editor does not have a selected item. HighlightMatches: Gets or sets a value that indicates whether matched items will be highlighted. AutoCompleteMode: Gets or sets the AutoCompleteMode of the RadMultiColumnComboBox editor. MatchCase: Gets or sets value that indicates whether text matching is case sensitive. KeepDropDownOpen: Gets or sets the KeepDropDownOpen of the RadMultiColumnComboBox editor. OpenDropDownOnInput: Gets or sets the OpenDropDownOnInput of the RadMultiColumnComboBox editor. DropDownHeight: Gets or sets the DropDownHeight of the RadMultiColumnComboBox editor. DropDownWidth: Gets or sets the DropDownWidth of the RadMultiColumnComboBox editor. DropDownMinHeight: Gets or sets the DropDownMinHeight of the RadMultiColumnComboBox editor. DropDownMinWidth: Gets or sets the DropDownMinWidth of the RadMultiColumnComboBox editor. DropDownMaxHeight: Gets or sets the DropDownMaxHeight of the RadMultiColumnComboBox editor. DropDownMaxWidth: Gets or sets the DropDownMaxWidth of the RadMultiColumnComboBox editor. DropDownPlacement: Gets or sets the DropDownPlacement of the RadMultiColumnComboBox editor. CloseDropDownAfterSelectionInput: Get or sets the CloseDropDownAfterSelectionInput of the RadMultiColumnComboBox editor. 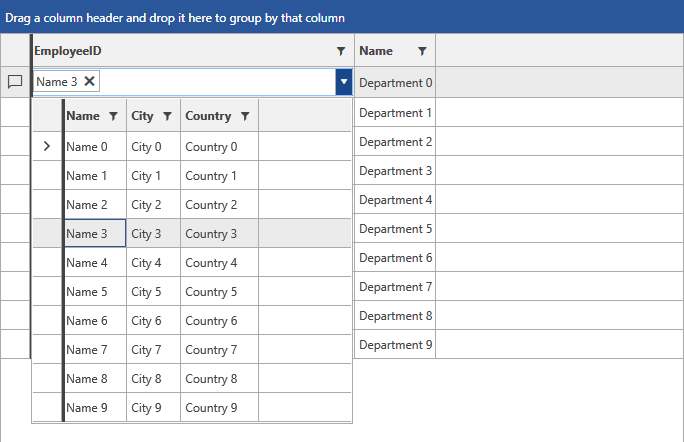 Examples 1 and 2 demonstrate how you can define some dummy data and set up a GridViewMultiColumnComboBoxColumn. The RadGridView is populated with a collection of Departments, each of which holds a collection of Employees. The Employees collection is set as the ItemsSource of the GridViewMultiColumnComboBoxColumn.